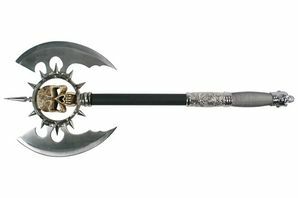 This frighteningly lethal axe is imbued with a dark curse forever consigning anyone who has killed with it to a dark corner of hell. On the other hand, the same is true for anyone who is killed with it as well. This weapon is best wielded by the more evil heroes as it lends itself well to pointless cruelty. It is said that this axe was forged long ago in a furnace kept alight by the burning of demon bones, by a powerful Pyromancer. This master of fire handed it over to the leader of a great army, about to do battle. However, it was then during the battle that an enemy Necromancer, jealous of such a powerful weapon, laid the awful curse upon it. From then on, every time a hero found out about it's curse, it was sold on to another unknowing hero. The story contains a prophecy that the weapon's demise will cause the end of the world, but it has long been disproved. This page was last edited on 7 February 2019, at 00:19.